Categories: External Walls, House Extensions / Conversions / Reconstruction, Other Materials, Panelling, and Timber External Cladding. Suppliers: Scyon™ Walls & Floors. 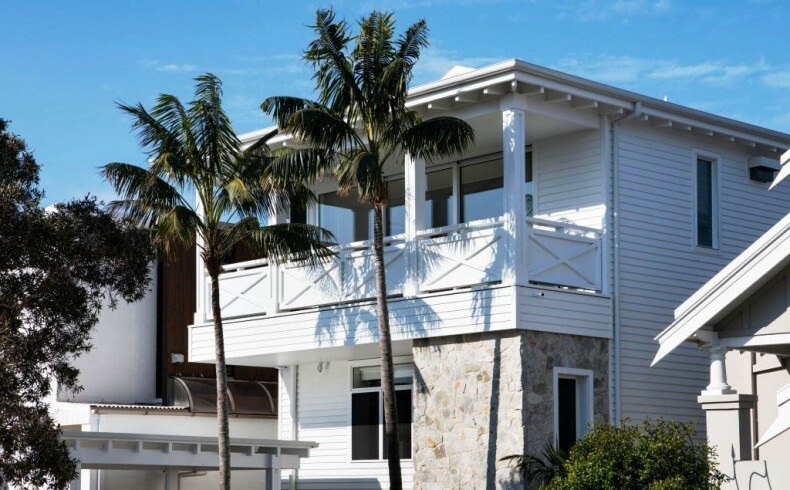 Affectionately known as “The Beach Hutt” in reference to the nickname “The Hutt” given to her by a close friend, the beautiful renovated two storey property on Sydney’s eastern coastline is one that only Deborah could have designed. The moment you turn the corner onto Deborah’s quiet coastal cul-de-sac, the brilliant white home stands out in contrast to the yellows and browns of the neighbouring properties. The home captures the brightness of the location while creating interest with a slowly shifting play of light created by Linea Weatherboard which is used around the full façade of the home. Deborah explains that one of the first big decisions was choosing Linea Weatherboard from James Hardie Scyon Walls and Floors. 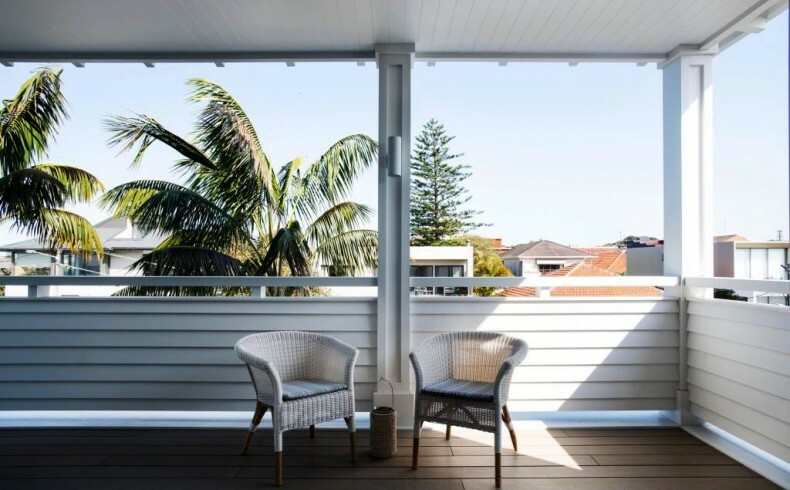 Deborah had a vision of the light and shadow effect you see in coastal and Hamptons houses; spotted the Linea Weatherboards at the Sydney Home Show; and found out they were more durable than timber and needed less maintenance. Stone cladding in soft greys was added to the front. 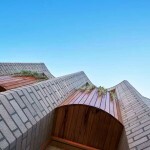 The natural shapes and texture of the rock contrast with the uniform straight lines of the weatherboard. 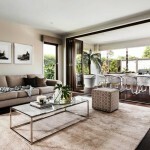 This look runs through the home, creating a flow from the outside in. 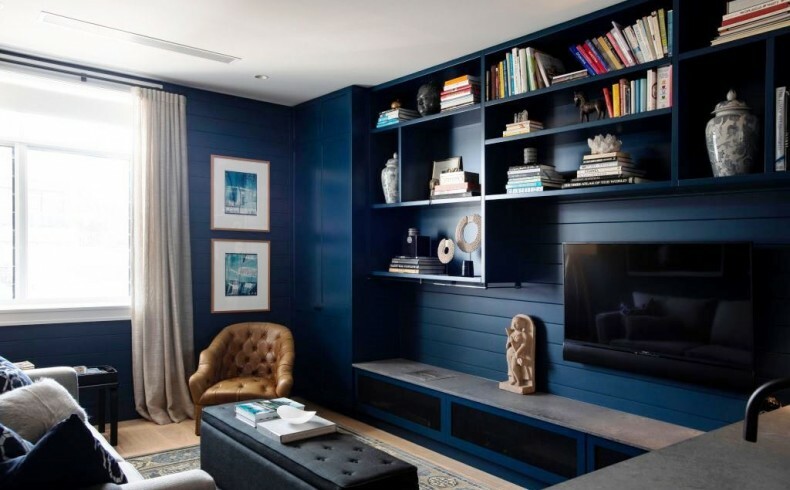 Inside, the lower level includes the guest-bedroom-come-media-room; an intimate and cosy space that, with its Resene Shadowy Blue walls and dark artwork, contrasts with the rest of the house. Completing the guest quarters is the downstairs bathroom which is flooded with light thanks to floor to ceiling windows that back onto the private side passage. Here Deborah has created an illusion of depth by covering the outside wall with artificial Boston ivy. Inside, the shadow lines of the façade are subtly referenced with the softer, squared groove profile of Axon Cladding, which is resistant to water damage making it suitable for wet areas; while tiles are used in the shower itself. 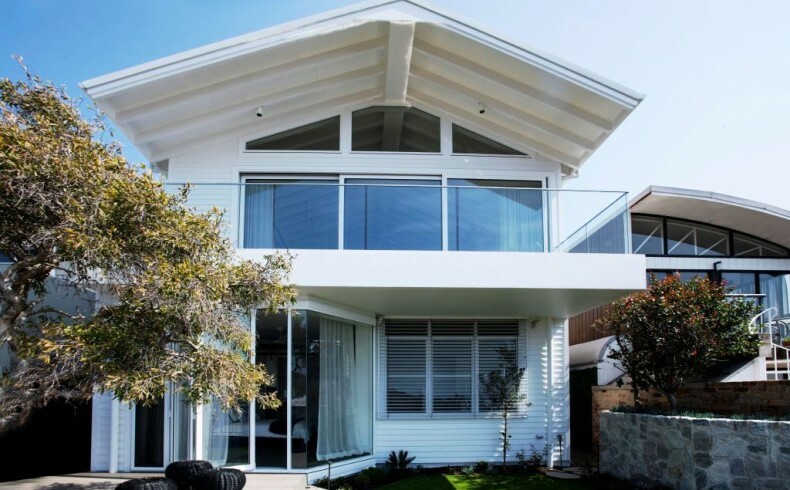 The exposed location on the clifftop means the back garden and balcony above take on the elements, which is where the Linea Weatherboards and HardieGroove come into their own. 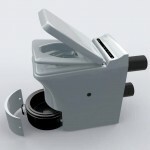 They create the look; and resist flaking, warping and swelling so require fewer touch ups. What’s more, they’re also resistant to fire and damage from termites and moisture so they’ll last a long time. As you head up to the living area, the first thing you see is the all-white, pitched ceiling where contrasting shapes engage the eye. A backdrop of HardieGroove with a subtle V-groove profile creates soft horizontal shadows, which are contrasted by a series of large solid beams. This play of light draws the eye through another set of floor-to-ceiling windows, out onto the balcony where the roof overhangs, creating a blurred line between the interior and exterior. The central position of the staircase has made room for details that are tailor-made to Deborah’s love of cooking and entertaining. Hidden behind vertical panelling along the right hand wall and down from a handsome kitchen area sit a butler’s pantry, a small powder room and a wine cellar that holds around 350 bottles. The rest of the open plan floor includes a living space, kitchen, and a dining area. This long-term planning of even the smallest details, as well as living next door to the renovation, helped Deborah avoid most issues. 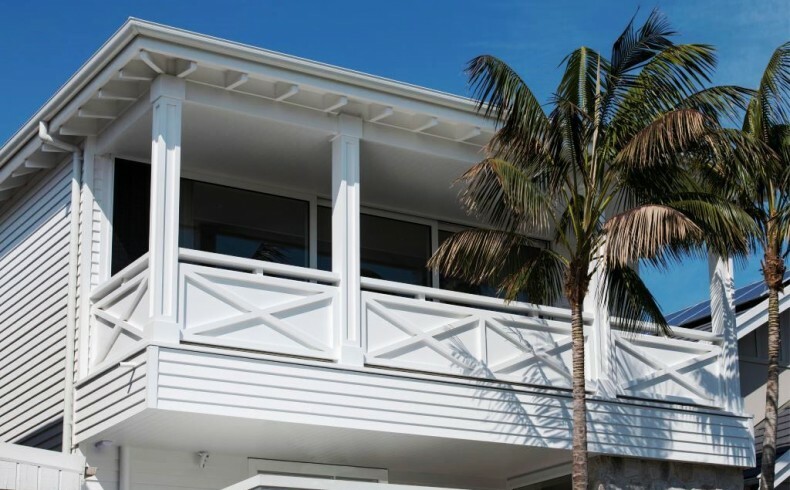 However one area that was particularly troublesome was the western balcony, which features solid panels lined with Linea Weatherboard suspended slightly off the ground by a series of Hamptons style pillars. The look is completed by a small rail, a nod to the balustrade on the original designs. 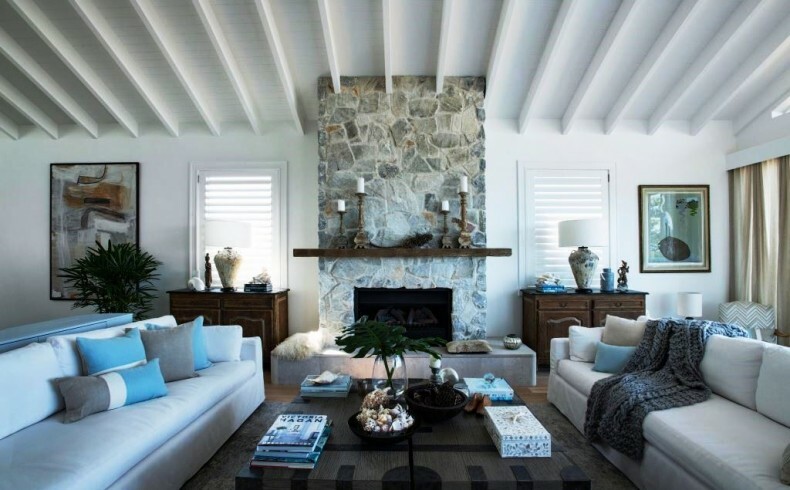 Hamptons designer Natalee Bowen suggested that the interior wall could be clad with Linea Weatherboards. The boards mirror the rest of the façade and continue that play of light into the living area. The deeper shadow lines also contrast with the HardieGroove that continues from the interior onto the overhang above the balcony.